The innovation that could produce the same amount of maple syrup from 50 acres of arable land as 500 acres of forest. 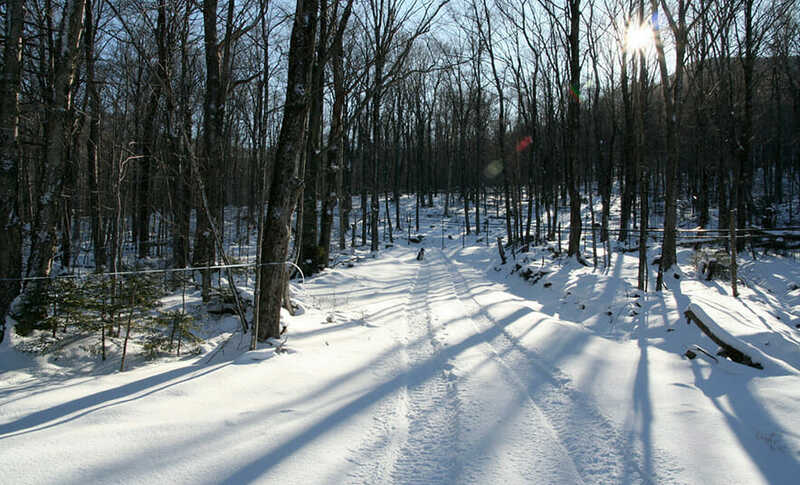 My husband, Eric and I have a farm and maple syrup operation situated on 1,000 acres of mostly wooded land in northern Vermont. I had walked a quarter mile through the forest to our house to retrieve our truck and upon my return, a medium-sized black bear ambled out of the woods and strode across the driveway right in front of me. I was stunned and enthralled since I had just five minutes previously passed by on foot. As I sat in the truck marveling, two young cubs popped out of the brush and hurried to catch up to her. They passed under the tubes that carry sap from the trees to our sugarhouse where it is processed and then continued through the forest and up the mountain. The bears pay no attention to the tubing and neither do the fisher cats or ermine or flying squirrels that make a home here. Though we have a presence in this forest tapping these trees for our livelihood, it only takes crossing paths with a bear to remind me that this land is still feral. While most crops are now harvested out of tidy rows in managed fields, the untamed northeastern woods have always been inseparable from the production of maple syrup. But a new discovery in harvesting sap may change that and bring big changes for those of us in the industry. 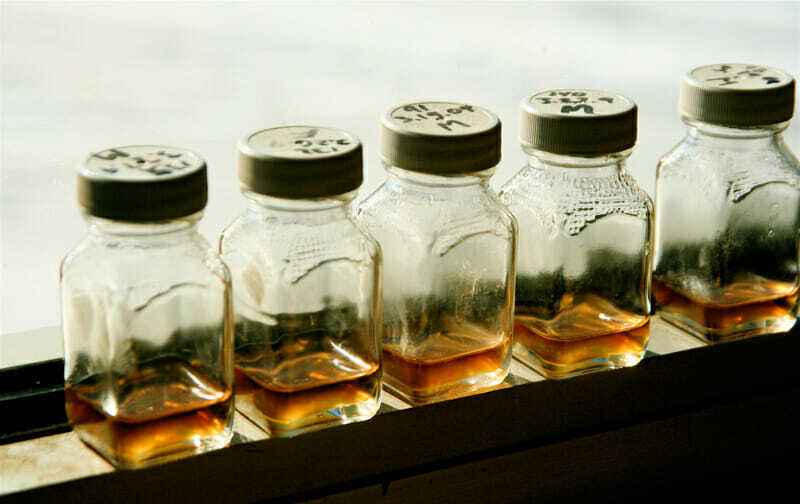 Vermont leads the United States in total maple production, pumping out 1,320,000 gallons of maple syrup in 2013. Maple syrup is produced by collecting sap from maple trees and boiling it down to syrup. In late winter as temperatures rise, sugarmakers, as we are known, will drill a hole in a mature tree and place a tap in the hole which drips the sap into a bucket or, more commonly these days, into tubing that leads directly to a reservoir or the sugarhouse where the syrup is processed. For those of us who use tubing, we usually have it under vacuum to keep the sap moving through the network. Once in the sugarhouse, most large scale operations are now equipped with a reverse-osmosis machine that then removes a large portion of the water from the sap, making the final step of boiling it down to syrup more efficient. The process has been modernized considerably since pioneers learned the practice from Native Americans several centuries ago. The one thing that has not changed is the necessity of a mature forest, preferably with a large concentration of maple species. In order not to destroy the mature maples in the research forest to test their theory, they went to the maple saplings planted near the lab which are often used to gather data. They lopped off the top of the small trees, put caps on them with a tube inserted, sealed the cap and put them under vacuum. The young trees produced impressive quantities of sap, even without the benefit of a crown. The pair thought that they may have hit on something big. “We were looking to see, do we really need the top of the tree to function? Can we still get sap and more importantly sugar from a tree without its top and we did,” says van den Berg. In a natural forest, which varies in maple density, an average 60 to 100 taps per acre will yield 40 to 50 gallons of syrup. According to the researchers’ calculations, an acre of what is now called “the plantation method” could sustain 5,800 saplings with taps yielding 400 gallons of syrup per acre. 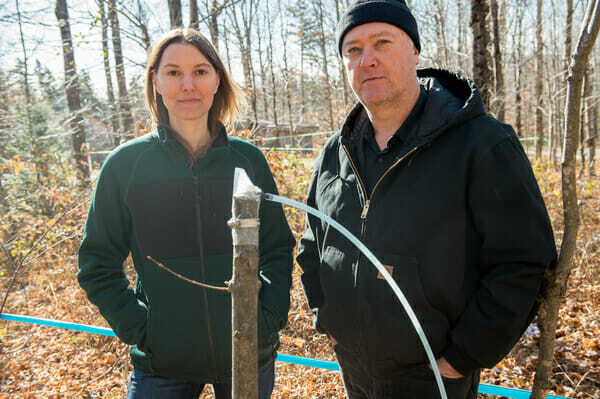 If the method is realized, producing maple syrup on a commercial scale may no longer be restricted to those with forest land; it could require just 50 acres of arable land instead of 500 acres of forest. Furthermore, any region with the right climate for growing maples would be able to start up maple “farms”. The natural forest would become redundant. A crew heads into the woods to tap and fix lines on the author's farm. Near empty syrup sample bottles. The author and crew member William Burt (foreground), high up in the mountains, tapping trees. Perkins and van den Berg, who have devoted their careers to the maple industry since 1996 and 1999 respectively, are optimistic the plantation system will benefit existing sugar makers. According to Perkins over 50 percent of the Vermont stands of forest with a viable sugar bush are in production at the moment. Given the robust price of maple syrup in the past decade, the value of remaining maple forests have risen considerably so anyone looking to get into the business or add to their holdings will have to put up considerable capital. With the plantation maple system, they can increase production using fields they may already have. Another benefit, which actually keeps production in the woods, is that sugar makers can use the technology to get production out of areas that have a very young forest or have experienced catastrophic damage. Occasionally, tornadoes, fire or ice storms devastate a standing forest and a producer will have to wait several decades for the forest to recover before that parcel is productive again. This technology allows them to get back into production with regenerated growth using trees that are just seven years old. The plantation system could also be a hedge against climate change. The flow of sap will always be reliant on the seesaw of freeze-thaw cycles no matter what size tree. Sap flows when temperatures rise above freezing but will diminish over several days unless it freezes again and then rethaws. The smaller saplings are quicker to start thawing as temperatures rise which gets the sap flowing sooner. 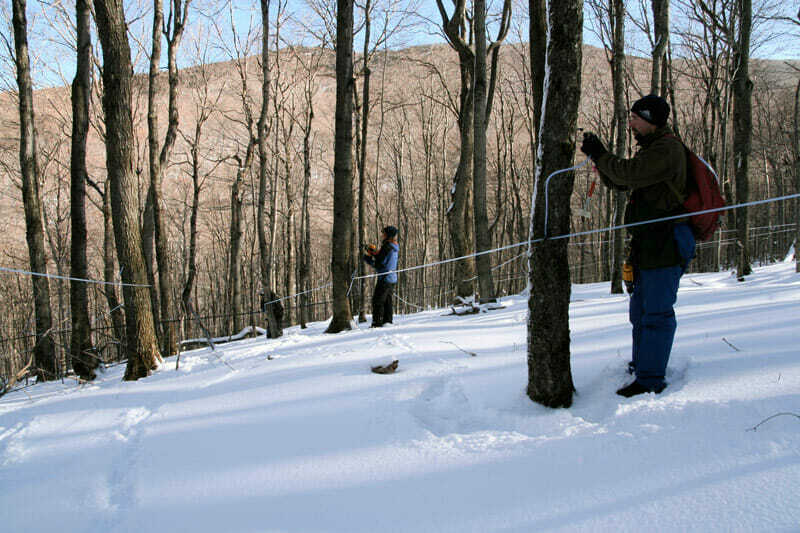 Perkins and van den Berg also found that the sap flowed from the saplings for nearly ten days without needing the “recharge” of a freeze cycle the way larger trees do. A more reliable flow of sap could make all the difference for a profitable season if weather patterns continue to stray from the norm. Finally, the sapling system is unappealing to the voracious Asian longhorn beetle, an invasive species that threaten to devastate the maple forests of North America. The beetles have been found in Montreal, Ontario and Massachusetts and are a constant bogeyman to sugarmakers. But the beetles prefer mature trees for their habitat and tend to spare the saplings. The plantation method certainly comes with enough appealing advantages, that it seems like a obvious choice for a sugarmaker to adopt the practice as a supplemental source of sap. But what if the plantation system replaced the current method completely? If maple does head in that direction, the change would not happen immediately. Perkins notes that their initial data showed that the cost of labor and materials for the new system was the same as a traditional system if you did not include the price of the land. In other words, despite the significantly higher yields from a smaller area, it would still take a great deal of time to hook up the saplings and a capital investment in more taps. Furthermore, the actual gadgetry needed to install the plantation system does not exist yet. Perkins and Van den Berg “hobbled together” the system using parts from their lab. But they’re anticipating that sugarmakers will want it – they’ve applied for a patent on the method and devices. So what do sugarmakers think? Dave Folino, owner of Hillsboro Sugar Works in Starksboro, Vermont echoed what many other sugar makers I spoke with said; it could be a game changer. Folino puts in 14,000 taps over 200 acres of his steeply sloped land. He notes that he is almost 60 and the thought of working on flat land in a more controlled space is tempting. But he also worries that the industry will shift to more workable land such as the fertile, northern Midwest. Personally the thought of taking maple out of the forest and turning into another row crop saddens me. We have been in the maple business since 2009 and our sugarhouse has a reputation for utilizing the most modern technology available to maximize efficiency of production. Nevertheless, the news of the plantation system has been a lot to chew on since we learned of it. We are relatively new to the trade but have come to love it, one of the principal reasons being our interaction with the thousand acres of forest behind our home. Like Dave Folino, I fear that the industry will no longer be special to New England but will be usurped by entrepreneurs anywhere with the right climate. And on a more visceral level, I feel that maple syrup is and should remain a product of the wild. Aside from mushrooms and game meat, the woods of Vermont hardly yield anything edible. And yet, this exquisite sugar can be extracted from the trees while still leaving them healthy and the forest a home to everything from rare wildflowers to bob cats. For me, knowing its origins elicits an amount of pleasure equal to tasting its unique flavor when I drizzle it over morning pancakes. Finally, I ponder what will happen to the acres of working forests if landowners are no longer making an income from them through tapping the trees. It would be unrealistic to expect all of those landowners to choose conservation. I am aware that change will come to the industry over the next few decades whether we adapt or not. There has always been a romantic notion of the tradition of gathering sap in buckets with horse drawn sleighs and boiling it down over a wood-fired pan. That image has already been replaced by tubing instead of buckets, four-wheelers instead of horses and sugar houses that resemble modern factories. This could be considered just another innovation to make the process of producing the amber gold easier and more profitable. When I ask Perkins if he is worried that the discovery will threaten the traditional industry he replies, “There is always that concern and I don’t think we should discount it. That said, anytime you talk about a new technology there are always people who say, ‘It’s going to kill the industry.’” He mentions several technologies, such as reverse osmosis and tubing which were met with skepticism when they were first introduced and are now considered essential to large scale production. Van den Berg doesn’t see it as a threat to the industry at all but as a means of improving existing operations. The spirit of the study, she says was to give sugar makers a new tool in the toolbox. Perhaps the researchers are right, and the plantation system is just another tool. In the meantime, I know change won’t come overnight. 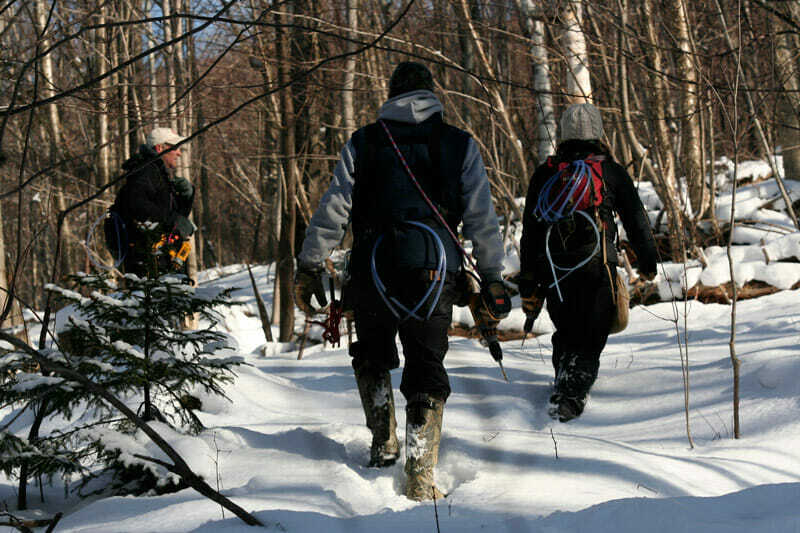 The 2014 season is already well underway and due to an early thaw, we are getting our first sap runs. We have been tapping the lower elevations near the sugarhouse but each day we’ll be heading up higher, going deeper into the woods. Do you have to use a vacuum to get reasonable sap flow from a topped off sapling?